Editor's note: Congratulations to Alicia S., winner of the Flattering50's $50 Visa Gift Card Giveaway!! There's still time to enter the Flattering50's Swimwear Giveaway. For details, click Giveaway. A Flattering50 reader recently asked me for the shopping sources for blazers I featured in a post about Slacks and the Evening Wedding. Unfortunately, that post is a couple of years old and the blazers shown are no longer in stock. Since we're entering a time when there's often lots of wedding invites, I thought I'd post some 2015 spring blazers that might do nicely with slack or a dress for a wedding guest outfit. Flattering50 readers have taught me that wedding guest attire often hinges on a wedding's location. Different regions have different traditions regarding what to wear and not to wear. Time of day is, of course, important too. That said, if wearing a blazer with a dress or slacks is appropriate for your affair, here are some "fashions for thought." For any occasion, but particularly a dress-up event, I like a feminine-looking blazer. What is a feminine blazer? In a nutshell, one that doesn't look like something one of the Mad Men might wear. It has soft lines and is nicely tailored. I'm particularly fond of draped or tuxedo lapel, like the jacket above. Skirt and pant suits aren't as popular as they once were, but monochromatic styling--wearing the same color or shades of color from shoulder-to-shoe--is. If you want to make a splash on any given day, wear a blazer and slacks in the same bright color scheme. A wedding, however, may not be splash appropriate. A splash may be best left to the bride and mothers-of. Instead, I like blazers in a flattering, cheery color (my over 50 complexion can use a bit of cheering up) paired with slacks in a complimentary neutral color. That said, I searched online and found a dearth of bright-colored blazers. Apparently, if you want to be trendy this spring, don't wear a bright-colored blazer. I don't care much about trends, but I do care about the amount of time on spend on shopping. To save time, I'll be looking for other pieces to brighten up my look this spring. I did find this one bright blue blazer, however. Needless to say, slacks for a wedding guest outfit have several advantages. They're super comfortable, versatile and solve the aging leg dilemma. While a well-made and well-fitted pair of slacks will serve you for many years, the blazer is the outfit's standout piece. It's the piece I would probably splurge on to get the best fabric and fit. Any dress-up blazer I wear has to be lined to support the fabric and help keep the garment's shape. While the blazer below is more "masculine" in styling, the snakeskin fabric keeps it feminine. 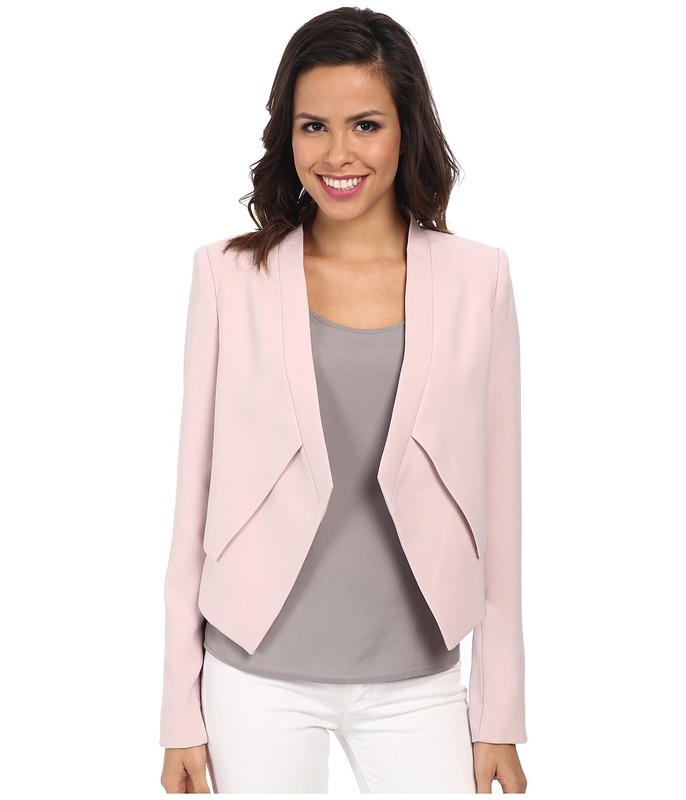 Here's a beautifully-made blazer with very feminine lines. While bright-colored blazers are hard to find, jackets in pastels, especially pink and lavender, are everywhere. If you can look past the teenage model, I love the color combo of the lavender, grey and white--very sophisticated. Neutral color, especially black and ivory, are all the rage this spring. I wear a lot of black (it's the New Yorker thing), but the only time I'd consider wearing a black blazer is to a evening wedding in New York in winter. Just as the color black tends to be a little grim for a wedding, an all white or off-white outfit might be a little too bridal looking. I like an off-white blazer like the one at the top of this post, but would pair it with pieces in other colors. Black and white blazers are another trend this spring. I like the clean, crisp look of a the black and white outfit below. My demure days are over. Since turning 50, my comfort zone has evolved in response to my changing body. For instance, I tend to wear longer blazers that cover part or all of my bottom with pants. For dresses, I like shorter blazers. A short print blazer may be a nice choice for a daytime affair. Another trend this spring: Zippered pockets.